Improved access to services and resources for California general public, schools, businesses, and the state. 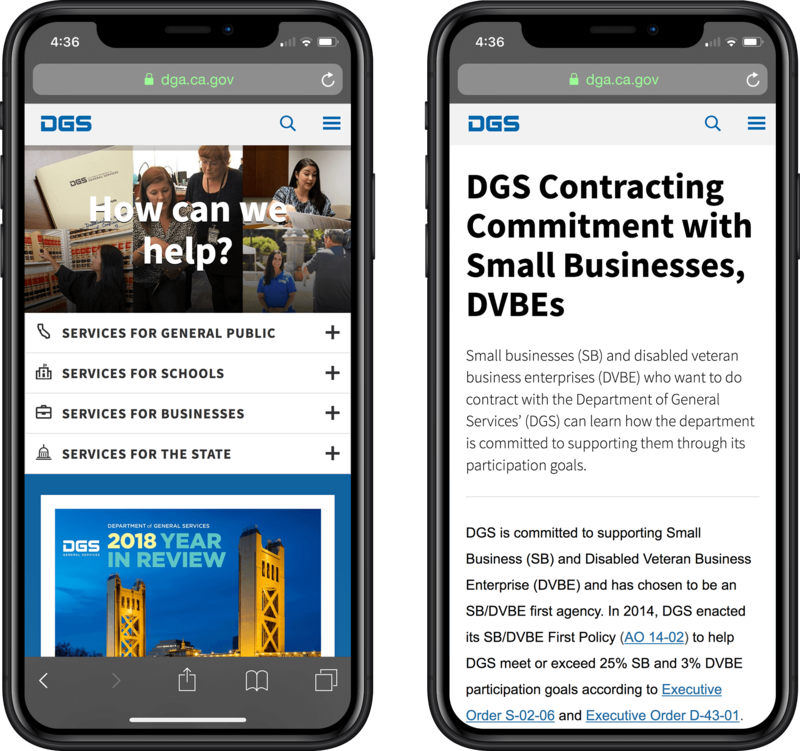 User experience, content design, accessibility engineering, and large-scale Sitecore integration for the California Department of General Services. A newly redesigned major state agency service portal providing information for over 150 services supported by nearly 20 divisions and offices. Key improvements include clearly defined services, advanced search and personalization, user-centric content organization, as well as content that is opened up to diverse audiences. Visit the portal at dgs.ca.gov or continue below to learn about our process, applied technologies, and project outcomes. Disconnected experience across different organization silos; organization-centric, instead of user-centric content; difficult to find and understand content; outdated interface and content management; WCAG 2.1 accessibility compliance; uninterrupted availability of key state resources such as California State Standard (STD) Forms and the State Administrative Manual (SAM) used by every California State department. Yes, including all DGS’ divisions and offices. User-centric content and navigation; personalization options; modern interface with improved usability, legibility, and readability across a range of internet-enabled devices; advanced content search and filtering; improved content management functionalities with advanced roles and permissions; content that is shared across divisions and offices; a set of content guidelines and templates that help content owners in writing user-centric content; and a large-scale Sitecore® Experience Platform™ implementation on Amazon Web Services. 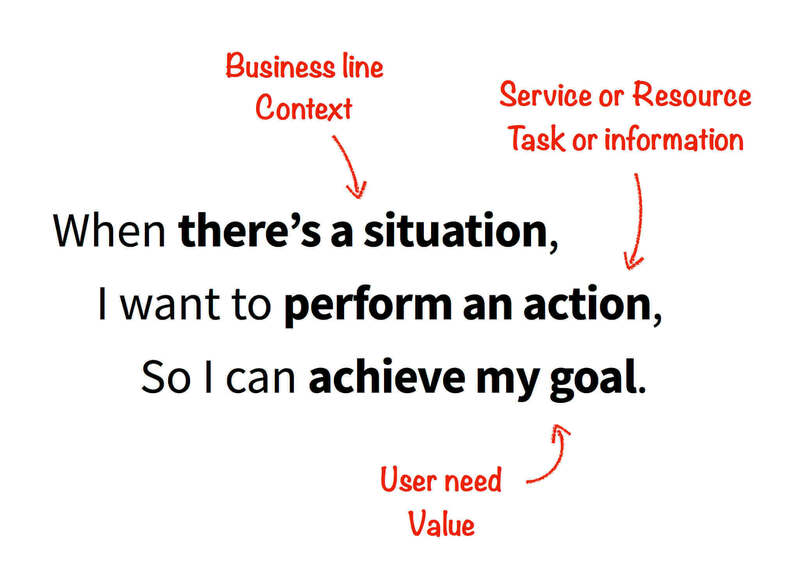 WCAG 2.1 Level AA accessibility compliance. The website and services are accessible on mobile phones and tablets. Better understanding of information, and improved service findability. Services are shared across divisions and offices instead of being siloed. Faster content publishing and website updates. Faster page loads due to optimized website delivery. 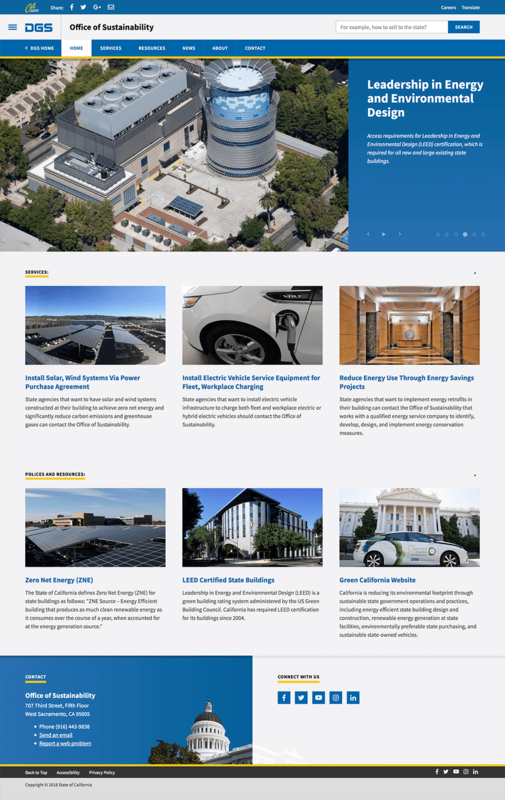 The California Department of General Services provides over 150 services for the general public, schools and school districts, private sector businesses, and other state agencies. A variety of services span procurement and acquisition; real estate management and design; environmentally friendly transportation; professional printing, design and web services; administrative hearings; legal services; building standards; oversight of the design and construction of K-12 public schools and community colleges; funding for school construction; and disability access. All these services are provided by almost 20 different divisions and offices. It is very common for a website of this scale to be used by both Low Volume / High Frequency, and High Volume / Low Frequency audiences. Essentially, the website audience encompasses a whole range of people from subject matter experts, to the first-time visitors who are still learning about the organization. The former group is much smaller in volume (hundreds), but visits the website almost daily. The later group is much larger in volume (millions), but they access the website very rarely. How do you provide all this information on a single website and still avoid confusing the first-time website visitors? Following general principle that more experienced customers would find their way around the introductory content provided for the convenience of less experienced visitors, we organized the website to serve both types of audience by providing multiple paths to each service and resource. Multiple ways to find content. Services and other resources are classified into categories, divisions and offices, website topics, and audience types, using Sitecore’s built-in tagging functionality. This enabled advanced search using convenient search filters. The positive side-effect of the website redesign was improvement in the way content is governed. Next to the DGS’ core project team and product owners’ expertise in user-centric content design and organization, a key to successfully established governance was support of the customer-focused executive office. With our guidance, product owners established and implemented a set of governance principles, which dramatically improved the quality of content that is now succinct, clear and to the point. Well defined services and service pages help customers find and access services they need, and gather information much faster, saving time and effort. 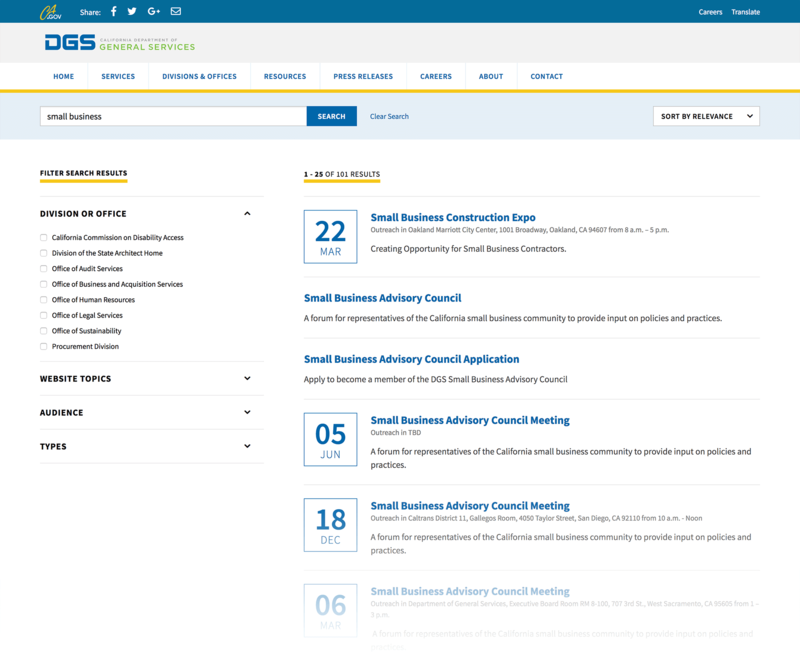 Different DGS divisions and offices share the same basic page structure within their website area. In order to facilitate rapid addition of new division, office, and program sections, we developed a feature that automatically creates a whole website structure for new organizational units. A one-click solution automatically creates news, event, and service pages, and also updates section navigation. After the section structure is generated, the only activity remained is uploading content to the automatically generated sections. One of the challenges of large scale content migrations is the number of concurrent users and the sheer volume of time required to set up pages for content authoring. 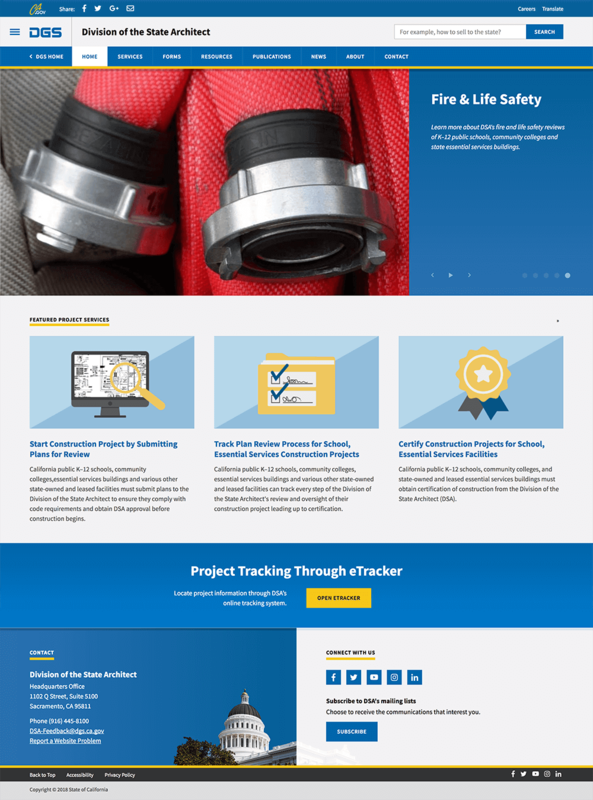 Compared to some other projects where editorial staff preferred to create each page from a blank canvas in order to customize layout, create variety, and encourage exploration (see SMUD Case Study) — one of DGS’ requirements was layout consistency maintained across different page types in order to reduce cognitive load for the website visitors. During DGS’ content migration, more than 80 authors created and edited content at the same time. 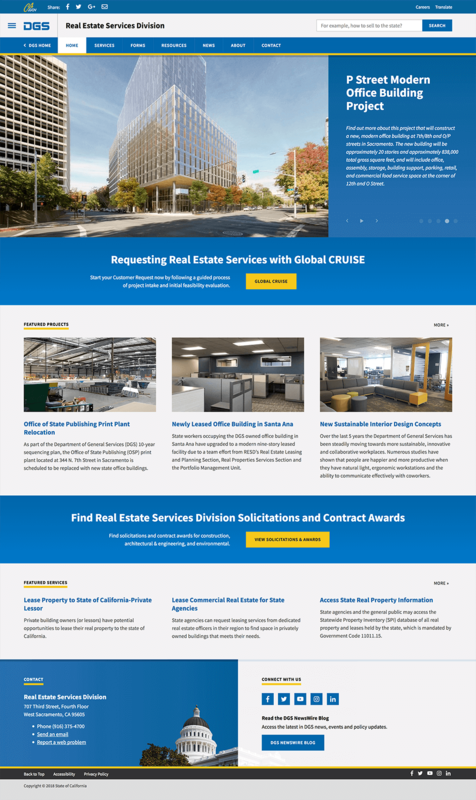 To cut down the time required to publish a page, SymSoft created a library of precomposed page templates for specific uses and content types, such as Guided Steps, Services, News, Events, Form page, as well as landing pages for each content type. SymSoft conducted content preparation workshops for DGS’ subject matter experts and divisional webmasters. The workshops included topics ranging from user-centric content preparation, to information architecture, to accessibility and search engine optimization, to photo and video publishing guidelines, as well as advanced topics such as progressive disclosure. 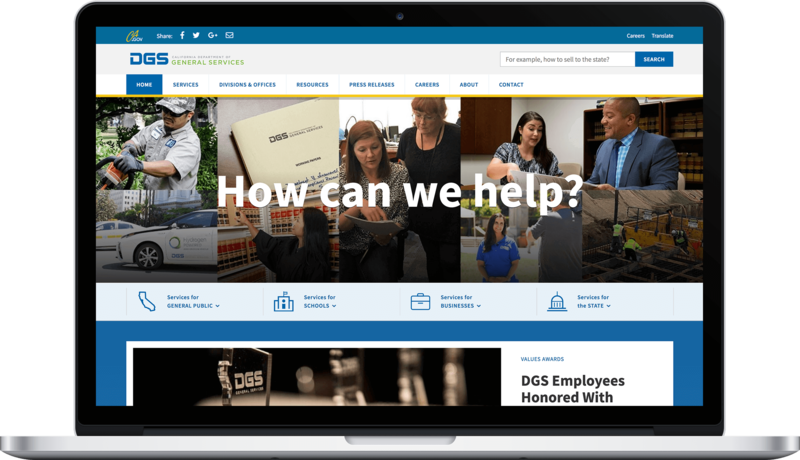 Utilizing the job story template helped DGS’ content authors to improve service and resource pages. The implemented Sitecore Experience Platform greatly contributes to the seamless content governance. Content is easy to classify and feature on the top level pages (also known as landing pages). Carefully defined user roles, permissions, and publishing workflows ensure content quality, which is especially important for the most accessed key services. To support content authors and divisional subject matter experts, SymSoft defined a content preparation timeline for each each division and for the project as a whole. Working with the project team and DGS’ Public Information Officer, we tracked progress on a weekly basis and optimized the process to better fit organizational culture. A number of flexible page templates and interface components allows content owners to customize information presentation on their service pages to best serve their audiences. Divisional pages share the same components, but can establish separation by rearranging components and providing unique content. This functionality is provided with the latest Sitecore Helix architecture. Sitecore® Experience Platform™ (includes Web Content Management, Analytics, and Personalization modules). Amazon Web Services, including Amazon Relational Database Service (RDS), Amazon ElastiCache, Amazon S3 (Simple Storage Service), AWS Direct Connect, Multi Availability Zones (multiple data centers at least 100 miles apart), and Amazon CloudWatch. Solr Search Platform integrated with Sitecore Content API to provide advanced search experience.